This enhancement, optionally, allows the system to estimate wind speeds below 34 knots (from 25 knots - 34 knots). For aviation/airport facility users, this will allow them to monitor cross runway wind forecast down to the 25 knot wind level. Some examples of this new capability are shown below. 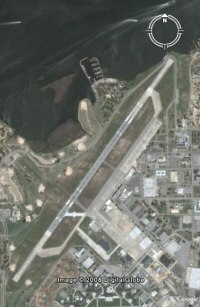 The impact report below shows the estimated winds for Keesler AFB (runway 030) during Katrina. Advanced Wind Estimation was not used for this report. The first yellow row indicates when the cross runway wind gusts are expected to exceed 25 knots while the red colored row indicates when the sustained cross runway component of wind is greater than 25 knots. The 25 knot wind radii estimation also affect storm graphics. On this example winds (with Advanced Wind Estimation ON), winds from Wilma (less than 34 knots) are shown up the entire east coast of Florida.